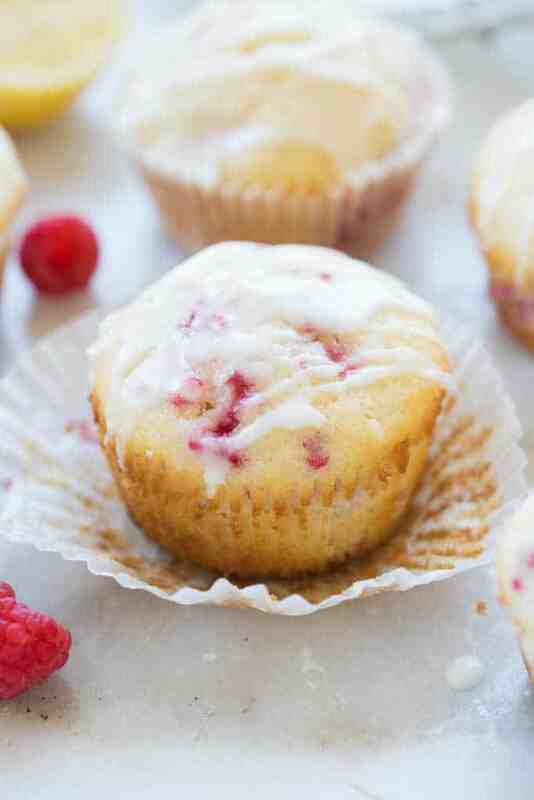 Deliciously light, fluffy and moist Lemon Raspberry Muffins. This easy recipe is a winner! Does anyone else have a huge problem keeping fresh raspberries around? My kids pretty much inhale them the second I buy them. If I want them to last longer than a day I have to keep them way up high in the fridge where they can’t reach them. We love them for breakfast with yogurt, cereal, muffins, or in pancakes. Growing up we always had a huge stock of the best raspberry freezer jam that I would eat daily. 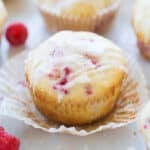 I’m just a raspberry fan, and these little Lemon Raspberry muffins are soooooo good! They’re fluffy, light and delicious. I like to make a big batch and freeze them so we can enjoy them for longer. 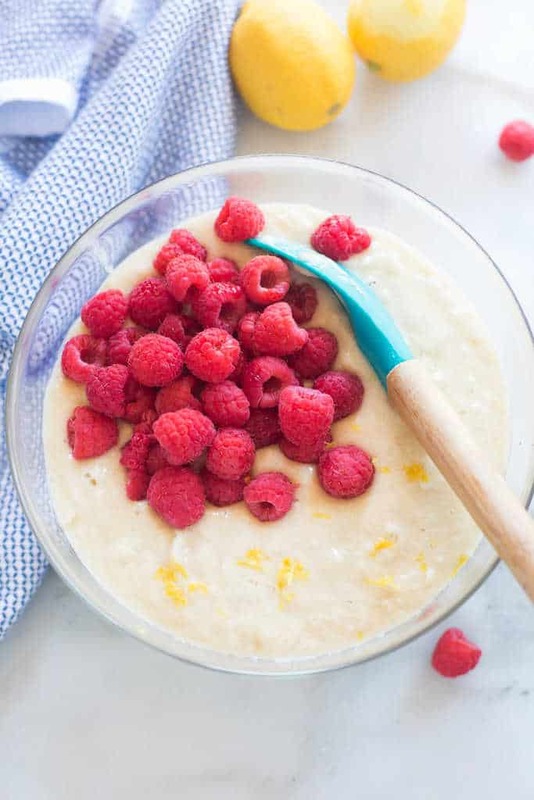 Just pop one in the microwave in the morning for 20 seconds and, voila: an easy, yummy breakfast on the go! I know I mention that one a lot, but it really does make a difference in baking. Put the eggs in a bowl or cup and run some hot water over them for a few seconds to quickly bring them to room temp. As with so many baked good, you really don’t want to overmix the batter for these muffins. When adding the wet ingredients to the dry ingredients just stir them with a spoon until everything is incorporated. It’s ok if it’s not perfectly smooth. Then, fold in the raspberries. 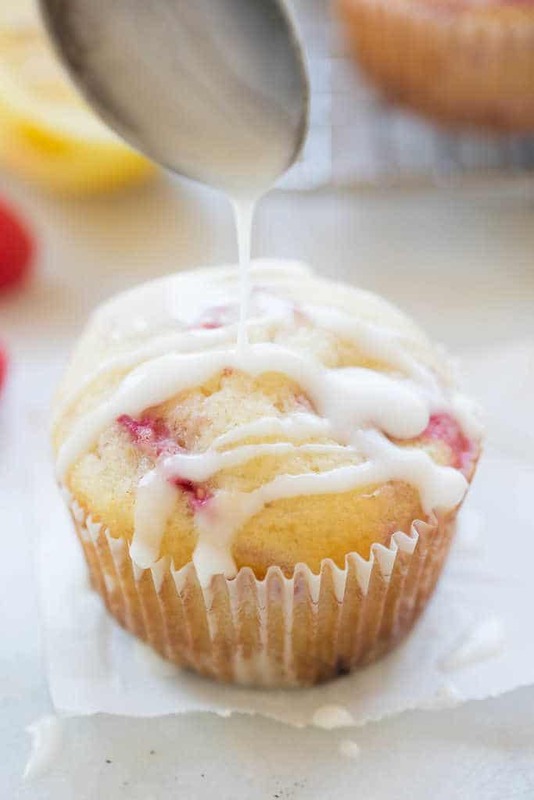 Gently mixing will really help you get the light and fluffy muffins you want. Fresh or frozen raspberries will work. I’ve used both in this recipe. I prefer fresh raspberries, but when they’re not in season I will use frozen. Also, you can substitute a different kind of berry! They would be delicious with blueberries or diced strawberries. Taste the glaze before using it. It’s really easy to adapt the glaze to your liking. Thin it with lemon juice or make it a little thicker with more powdered sugar. In a measuring cup mix together milk and lemon juice. In a separate large bowl combine dry ingredients: flour, sugar, baking powder, and salt in a large bowl. In a small bowl, whisk together the confectioners sugar and 2 tablespoons lemon juice. (if you want the glaze even thinner, add an extra tablespoon of lemon juice). Allow the muffins to cool for a few minutes before drizzling with glaze. I originally shared this recipe in February 2014 (adapted from Love Grows Wild). I’ve updated it with new photos and nutritional information. These muffins are INCREDIBLE! I have been searching for the perfect muffin recipe, and I have always been disappointed. I was about to throw in the towel, when I came across this recipe. I made them exactly how the recipe is written and they turned out succulent and light and fluffy. I made them with blueberries, raspberries and strawberries (not all together) and they all turned out exquisitely. Thank you very much for sharing this recipe with us. I look forward to exploring your website and baking some more of your delicious goodies. Thank you so much! I’m thrilled you enjoyed them so much :)! What a great compliment! Thanks Terry! Absolutely the best muffins I have ever made! I used fresh frozen raspberries and blackberries!